A while back when I was looking for a good oil for the Jeep Wrangler, I decided to give Pennzoil a try. They have a full synthetic product they call "Pennzoil Platinum" that a lot of people were saying good things about. They also have a "Pennzoil Ultra Platinum" that is supposed to be even better, but I was never fortunate enough to find any of it available at Walmart. In case you didn't know, prices on brand name oil is pretty reasonably priced at Walmart. 5 quart jugs of just about everything runs around $25.00 or so. Anyway, I started using the "Platinum" in the Jeep, and since the engine hasn't failed there yet, I supposed it was pretty decent. PurePlus® Technology is our patented, revolutionary gas-to-liquid process which converts natural gas into a first-of-its-kind, high quality full synthetic base oil. 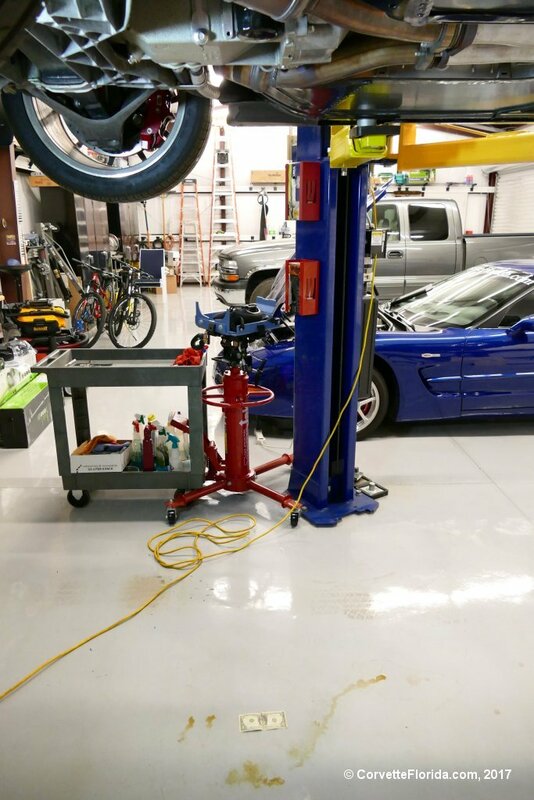 Because our base oil is made from natural gas, it is clear with fewer of the impurities found in crude oil, the start for many other traditional and synthetic motor oils. To that pure, clear base we add our high performance additives to create Pennzoil Platinum® with PurePlus® Technology, motor oil designed for complete engine protection, without compromise. Pennzoil Platinum® Full Synthetic motor oil with with PurePlus® Technology keeps pistons up to 30% cleaner than required by the toughest industry standard1 and keeps your engine cleaner than any leading synthetic oil. Since I still had the C6Z under extended warranty, I decided to try it out on the C6Z as well. Been hearing rumors of people having some issues with the latest formulations of Mobil 1, so I wasn't keen on using that stuff. Removing lubricating additives in order to prolong the life of the catalytic converters didn't seem like a wise tradeoff to me. 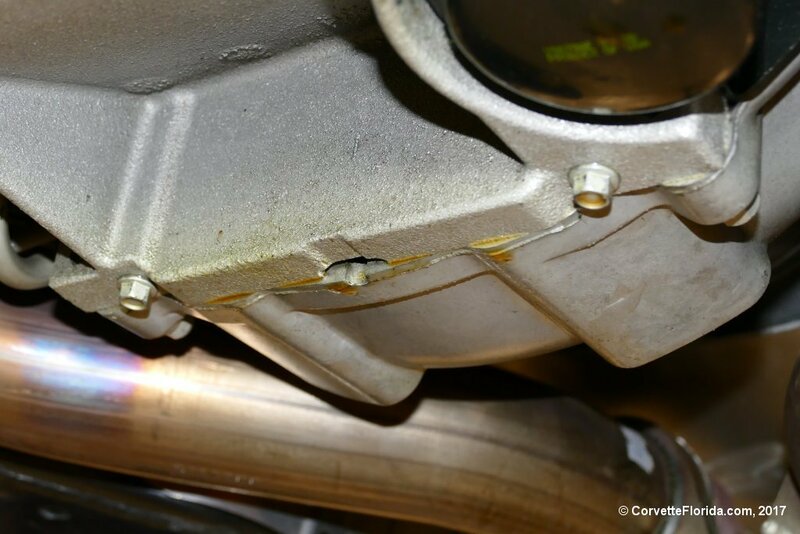 You could buy a LOT of catalytic converters for the cost of a prematurely worn out LS7. After the first oil change on the C6Z, I began to notice a little spot of oil underneath the engine area whenever I would get around to taking the C6Z out. After the second oil change, things seemed to be getting worse, but really only slightly so. I thought perhaps I hadn't tightened the oil filter quite enough, or perhaps the seals on the oil pan drain plugs weren't quite right for some reason, so I didn't think too hard on it. Then right before Connie and I went on vacation back in May, I changed the again, still using the Pennzoil Platinum 5W-30. And the car sat in the garage bay while we were gone. 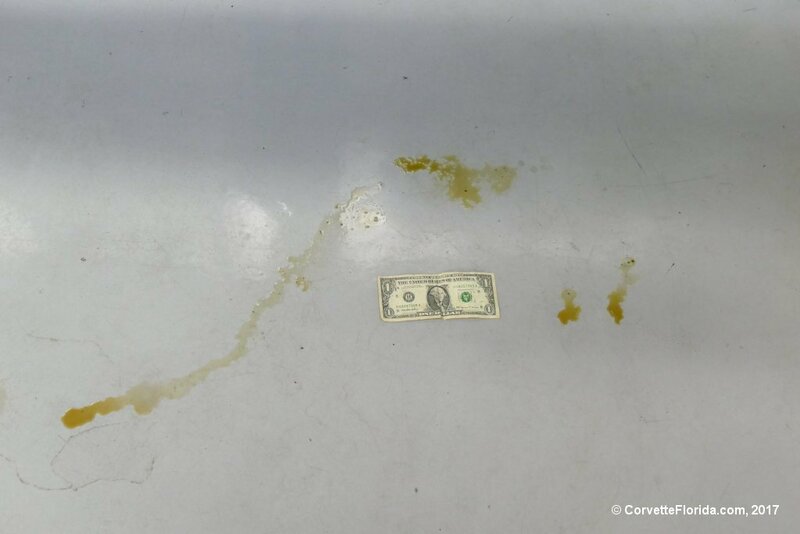 So the other day I glanced underneath the C6Z, and saw what looked like larger oil "puddles" on the garage floor. 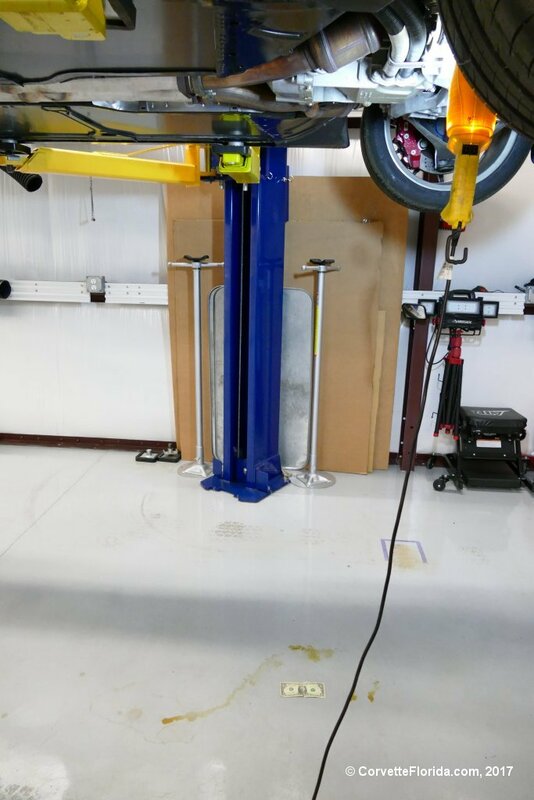 So I put the car up on the lift to take a closer look. Hmm.... Looked like leaks from multiple areas to me. So I looked closer at the engine. Looks like leaks from the oil filter, both oil drain plugs, the oil cooler line (I guess that is what it is), and maybe from the rear main seal. The interesting thing about this is that I have taken the car out for a drive (before the monsoons set it), and put the car immediately up on the lift. I never once saw any signs of any leaks after driving the car. It ONLY seems to leak after the car has set for a while. 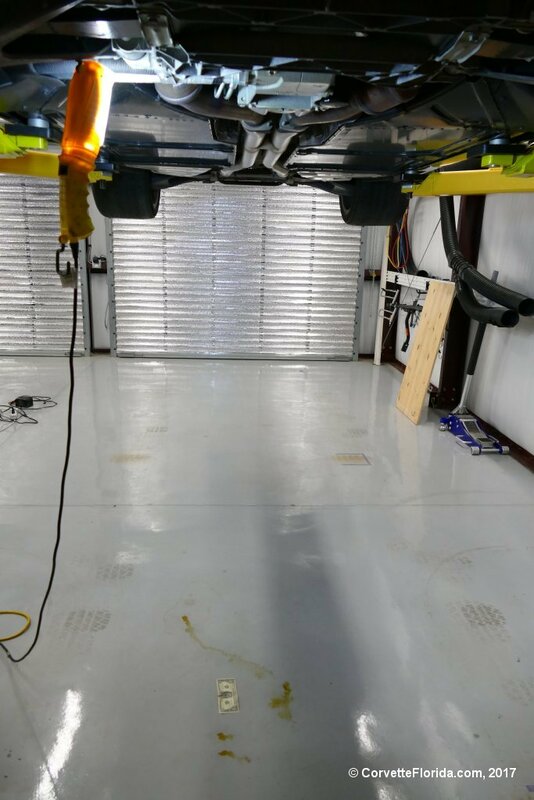 In this last case, the car set for a good 7 to 8 weeks without moving, and you can see above what I saw on the floor. 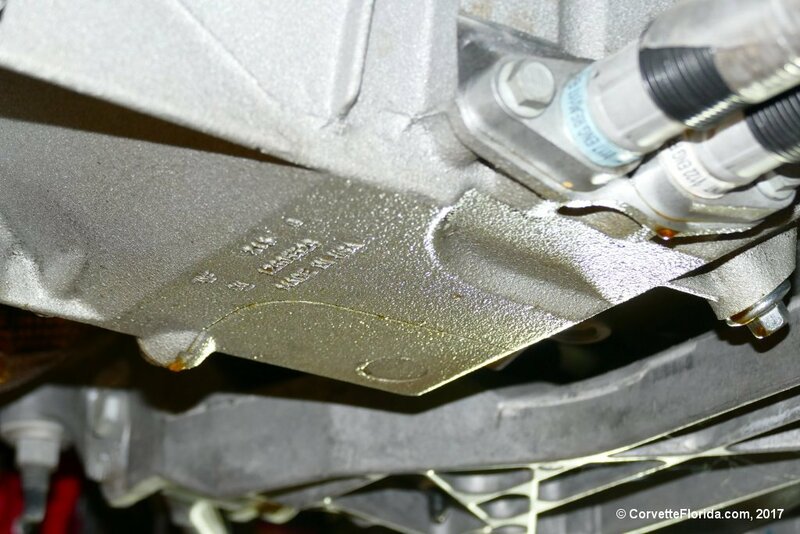 I did some snooping around on the web, and found other people complaining about getting oil leaks after using Pennzoil Platinum, claiming that the oil cleans the engine TOO well, and can clear out gunk around the seals, causing oil leaks. Not sure how believable that is, but my C6Z only has 20K miles on it, and the oil has been changed frequently, so not sure how any gunk could have gotten around the seals to be cleaned out. In any event, I decided to change the oil and filter again, even though I only had about 100 miles since the last oil change. This time I went with the Joe Gibbs 5W-30 LS30 synthetic oil that I have been using for the C5Z to see if that makes any difference. The oil leaks aren't bad, of course, but sure is a nuisance to see oil on the garage floor. That reminds me that I need to check out the Jeep to see if that is getting oil leaks too from using that Pennzoil Platinum stuff. In thinking about it, I'm wondering if the Pennzoil Platinum just gets too thin when it is cold and is able to seep out between the seals as a result. I guess this would be a good thing for oiling the engine, as you could be certain that every nook and cranny on the engine is going to be getting oil between the metal parts. But maybe this is a classic case of too much of a good thing. I guess I'll see what happens. Hopefully the leaks haven't become permanent leaks from using that Pennzoil stuff. Great write up and pics to go with it. I had heard way back that a car that uses regular oil, and then changes to synthetic, can experience oil leaks. Your situation is different, though, since you just went from one syn brand to another. When you say you've heard rumors that some were having issues with new Mobil formulas, are you referring to their new 1 year oil? I heard that's not going over so well. I go on binges where I read a LOT about various motor oils, basically comparing one against another. I suppose many car people go on the pursuit of finding what they think will be the *best* oil for their engines. The goal, at least for me, is to find an oil the basically ceases all engine wear. So when I read accounts (wish I could remember who) of a shop claiming that with the new formulations of oils that have eliminated zinc (ZDDP) and phosphorus, unusually early failures of turbochargers (which typically have journal bearings) have been noted, it raises a red flag to me. We are talking about WEAR here, fellas! Yeah, I know the manufacturers are claiming that this reduction or removal of ZDDP only affects older engines with flat tappets, but I guess I've become suspicious of claims that don't seem quite logical to me. How do engines wear out then? Crankshaft bearings, rod bearings, camshaft bearings, are all journal style bearings. What about the contact of the piston rings against the cylinder walls? 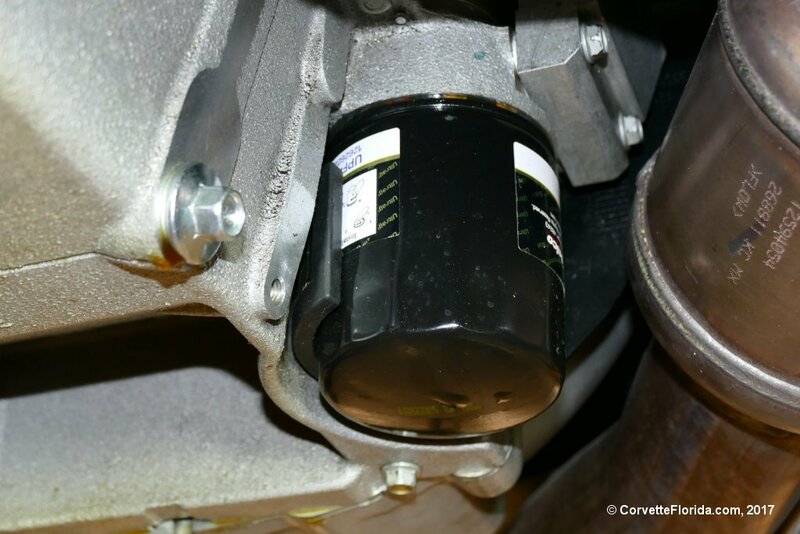 Doesn't a product that helps to reduce wear on all of those parts worth keeping in the oil? Apparently the government has mandated this change in engine oils, and I don't know about you, but my faith in government officials having an adequate understanding of oil technology, much less having a vested interest in my engines lasting as long as possible, is pretty much non-existent. Anyway, yeah, I know some people swear on Mobil 1 synthetics. And I would imagine for my Jeep Wrangler 6 banger, just about any oil will be just fine and dandy in it. But for the high performance engines in the vettes, well, I don't know about you, but I'm thinking more horsepower is going to mean more forces at work against bearing surfaces. So I want a little extra there, regardless of what the government says it thinks I need. I've got 170K miles on my LS-6 now using nothing but Mobil 1 and she still runs like a scalded dog. I went to the LS-7 clutch a few years back and replaced the rear main seal just because it was there. It has developed a slight drip from the oil pan gasket in the last 2 or 3 months but still doesn't show any loss between oil changes. I change the oil and filter every 5000 miles and I also use the PF-46 AC Delco filter. On the other side of the coin GM along with Porsche, Bentley, Toyota, Lexus, Daihatsu, Hino, Chevrolet, Cadillac, Opel, Vauxhall, Buick, Holden and Perodua(make I've never heard of) have designated Mobil 1 their "Official" oil brand. From an engineering standpoint along with the bean counter standpoint I would want to choose an oil that would not invite failure to my engine, in part to reduce warranty repairs due to lubrication failure and also because a product that does last beyond the warranty period is just plain good advertising. We all know that bad news travels faster than good news. Honestly, ALL oils are so much more advanced today than in the early days of the internal combustion engine that I doubt lubrication failure is much of a problem now. I figure a followup is in order here. About a month or so after I posted this thread, I had a failure on the C6Z that turned out to be a wheel speed sensor on the passenger side front wheel. The indicator I got was an ABS fault on the DIC. When I was pulling the car out of the garage one day, I heard a *clunk* which sounded like the brakes grabbing. Then the DIC light came on. In hindsight, I guess the *clunk* sound was the ABS system complaining before giving up and sending up the red flag. So I decided to get it looked at. Turned out that the hub needed to be replaced, since the wheel speed sensor is integral to the wheel hub assembly. This was done by the local Chevy dealership since the car was still under the extended warranty I purchased when I bought the car. I was also informed that the service tech discovered that the brake booster/master cylinder was leaking brake fluid. So that got replaced as well. The interesting thing is that now, many months later, what I thought was an engine oil leak has just gone away. Not a drop leaking any longer. So was I seeing brake fluid underneath the engine instead of engine oil? Sure seems to be the case. But what a coincidence that the signs of leakage were being exhibited at the oil drain plugs and the oil filter! And the fluid sure did look like engine oil to me. I never would have guessed that it was a brake system leakage. I mean, what are the chances? But did I notice a loss of fluid in the brake master cylinder reservoir? Sure didn't. Can't say I even looked closely at it, to be honest. So I guess you just never know. Something that seems like a simple leak could be something completely different from what you assume you are looking at. So you go about trying to fix the wrong thing, and get puzzled by your efforts having no effect whatsoever. And like a dummy, I kept thinking that my repair just wasn't good enough, so I kept trying harder to fix what wasn't the actual problem. Yeah, that could be. But I noticed that even after I changed the oil to a different brand, and used double gaskets on the oil drain plugs, I was still having leaks. And they sure as heck looked like the drain plugs were leaking, so I was REALLY baffled about that. I didn't do anything topside on the engine, and if it actually was an oil leak from ABOVE, I sure didn't do anything to fix that. If the dealership had found an oill leak and fixed it, they sure enough would have told me about it. As it was, I didn't know anything about that brake fluid leak, so they certainly found that. Which I am real glad of, as my extended warranty was coming to an end a month after I took it in for that repair.